11 x 17 Rolled Blank Scroll | Blank Scrolls | Scrolls Unlimited, Inc.
Our 11 x 17 "Rolled BLANK Scrolls" are our most popular size if you are looking to make an impression with a message you want to write. 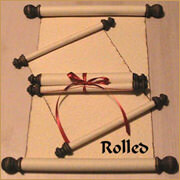 These scrolls are great for special projects, events and props. Extra BLANK pages can be added.